WASHINGTON -- An American expert on Asia voiced concern Wednesday that US President Donald Trump appears to be serious about wanting to pull US troops from South Korea. Michael Green, senior vice president for Asia at the Center for Strategic and International Studies, said he believes Trump meant it when he told reporters after last month's summit with North Korean leader Kim Jong-un that he would eventually like to get the troops out. "That's a Christmas present in June for the North Koreans, Chinese, and Russians," he told a forum here, alluding to those countries' aversion to a US troop presence near their border. "I think he means it, and it worries me because historically the US has understood the maritime allies in the maritime domain, but it's always been a little reluctant to be tied down on the peninsula." He attributed that reluctance to a "very misguided" view among some strategic thinkers that in order to counter China's rise, the US must consolidate its alliances with countries such as Japan and Australia. South Korea, according to that view, is a liability. "It completely ignores a whole bunch of things which you can go into, including the fact that China will quickly pocket the strategic influence over the Korean Peninsula and double down its focus on maritime alliances, or the fact that North Korea will take advantage of that vacuum," Green said. About 28,500 American troops are stationed in South Korea as a legacy of the 1950-53 Korean War, which ended in an armistice, not a peace treaty. Trump has repeatedly accused South Korea of not paying enough for the troops even though the Asian ally currently shoulders about half the cost of their upkeep. 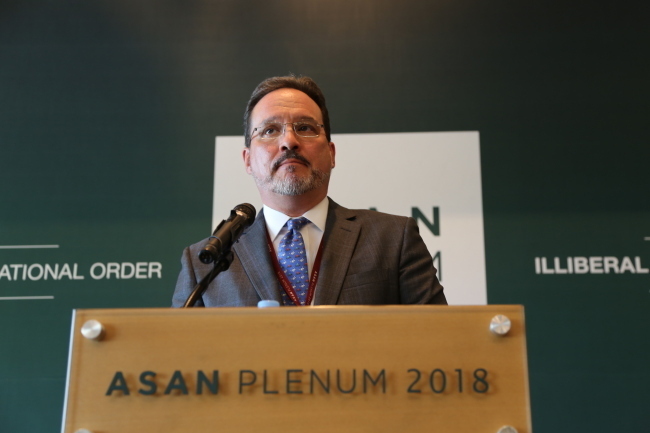 "I suspect that the biggest fight in Asian alliances over the coming few years is going to be our presence in Korea, and it may end up being even worse than NATO," Green said, referring to Trump's repeated complaints that member states of the North Atlantic Treaty Organization don't contribute their fair share for defense.